Just some of our team…. A design & quality focused member of our team. Shane project manages most of our bathroom installations. Having over 20 years experience plastering, Barry is a dedicated professional making sure our walls & ceilings are super smooth. A talented, time-served joinery expert, Colm designs, builds & project manages loft conversions through this website to the highest standards. Jim takes care of all our joinery & woodwork in our projects. He's a time served professional & takes pride in any work or project he undertakes. Owns & manages Buildingrooms. Co-ordinates & arranges the daily building activities for the company's clients. 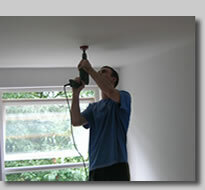 We feel it’s important you should know exactly who you are dealing with on any building project in your home . Here’s a little information, an introduction to some of our team & background for the skilled building trades they provide for our clients. Rod is responsible for tiling, ceramics & natural stone work for our projects. Sub-Contractor Plumbing engineer Steven provides a valuable service & back-up for all our gas, heating & general plumbing requirements.